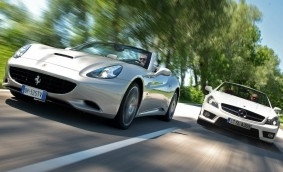 For 54 years while Jaguars, BMWs, and Cadillacs have come and gone, the Mercedes-Benz SL has been the king of the trophy-car convertibles—the sort of car that not only says its owner has arrived but that he’s been around for a while. Ferrari’s latest offering, the California, uses the template of the latest-generation SL: a folding-hardtop convertible and a transmission that does without a clutch pedal. Ferrari is positioning the California as a less expensive companion to the 599GTB and 612 Scaglietti grand tourers, leaving the mid-engined F430 to represent the harder-edged realm of Ferrari’s sports-car ambitions. So the overlap in price—the California’s base price of $197,350 is only $22,810 less than the convertible F430 Spider’s—isn’t supposed to be a problem, but some sales cannibalization is to be expected. Also inevitable are comparisons with other cars in the segment, even if potential owners more likely cross-shop their purchases with helicopters or gold-plated hovercraft. This brings us to the Mercedes-Benz SL63, recently updated for 2009 with revised styling, a new (for the SL) 6.2-liter V-8, and a shift-time-hastening multiplate clutch (in place of a torque converter) between the engine and the seven-speed automatic transmission. The SL65 AMG, which starts at $198,175, might be closer in price to the Ferrari, but the maniacal power of its twin-turbo V-12 and the extra heft over the front wheels in the SL65 make the SL63 a more manageable and enjoyable car to drive. Plus, the SL63’s output of 518 horsepower is closer to the California’s 453 ponies...Read the entire article at Car and Driver.com!